On February 14, 1920, six months before the ratification of the 19th amendment, the League of Women Voters was born. This February 2019 is the launch of the centennial year for women finally being allowed not only to vote but also to be elected. The Amendment had passed the U.S. House and Senate in 1919. The Snohomish County League of Women Voters, as a kick-off to the 100th year, will be celebrating this milestone for women through a focus on women mayors. The League has invited the women mayors of Snohomish County to be celebrated at the League’s Birthday Luncheon, in the Greenside Room at the Everett Legion Memorial Golf Course, 144 W Marine View Dr, Everett 98201 on Saturday, February 16, from 11am to 1:30pm. Actress Debbie Dimitre will present a character sketch of Bertha Knight Landes, Seattle's first woman mayor. 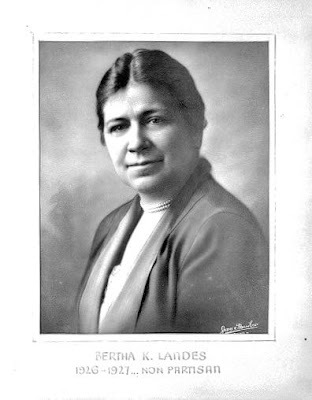 Although she was not the first woman mayor in Washington State, she is considered the first in the nation in a major city. The 2019 Democracy in Action Award will also be presented. This year’s recipient is Kristin Kelly of Snohomish, honored for her professional and community activism in environmental causes. Cost for the luncheon is $25 per person, payable the day of the event. Persons interested in the League or in this program are welcome. The deadline to register is February 10, with Judy Chapman, LWVSC Treasurer.